(Fort Worth, Tx)…Michael A. Jackson, J.D. 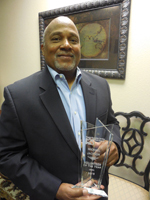 was announced as the winner of the 2015 Gerald N. Summerford Volunteer of the Year Award during the Dispute Resolution Services of North, Texas Inc. (DRS North Texas) annual awards banquet held recently at the Fort Worth Club. The DRS North Texas Volunteer of the Year award was established in 1996 to commemorate Gerald N. Summerford’s immeasurable contribution to the advancement and success of DRS North Texas, its programs, and services. Executive Director Jacquelyn Flynt states she was “honored to recognize him as our most recent Volunteer of the Year award winner. Michael is a consistently effective mediator and is always friendly and pleasant to everyone he meets. Many of our trainees over the years would no doubt agree that he is also a very knowledgeable and entertaining mediation instructor”. Michael grew up in Fort Worth and graduated from Polytechnic High School. He continued his education earning a Bachelor of Business Administration degree from Texas Wesleyan University (College); a Master of Human Resource Management from Keller Graduate School of Management in Kansas City, Missouri; and a Doctor of Jurisprudence from Drake University School of Law in Des Moines, Iowa. Michael joined DRS North Texas as a volunteer in April 2004 and to date has given nearly 1,000 hours in mediation service. He is an integral part of the DRS North Texas Basic & Family Mediation training program, often being invited as a trainer to teach on generating settlement options, mediated settlement agreement writing, mediator ethics, diversity, and landlord/tenant disputes. Community minded, Michael has served as board president on the advisory committee for the Sickle Cell Disease Association of Tarrant County, former vice-chair and board member for Texas Inmate Services, and has served on the Diversity Advisory committee for the United Way of Greater Tarrant County, and served on DRS North Texas board of directors. Currently, Michael serves as an adjunct professor of Business at Tarrant County College teaching classes in Business Law, Business Principles, Principles of Management, Business Ethics and Human Resource Management. In his free time, Michael enjoys golf, home repair projects, reading John Grisham novels, and volunteering as a mediator for DRS North Texas.